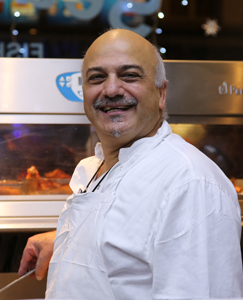 In 1978 Izzet started working as a chef at the Psistaria restaurant in Victoria Street and then moved to its later location in Wilton Road. After steadily growing as a more experienced chef, he went into business with his brother in 1986 and opened the well-renowned “Beachcomber” seafood restaurant in Greenwich. He was working as the head chef at this restaurant for 26 years, gaining a reputation for his creativity and knowledge of the catering industry. He then returned as the head chef at Seafresh in 2013, with the ambition and drive to take the restaurant’s food to the next level.